I’m still trying to learn more about sketching. Recently, I took a break from writing for a week to do sketching from my couch, and I found it very enjoyable. I am still not confident or comfortable with myself as a visual artist — I find myself falling back to words and text to understand and view the world — but I want to become better at sketching. I am interested in how different media forces you to have a different kind of perspective, and how different art changes the way we tell stories to each other (and ourselves). 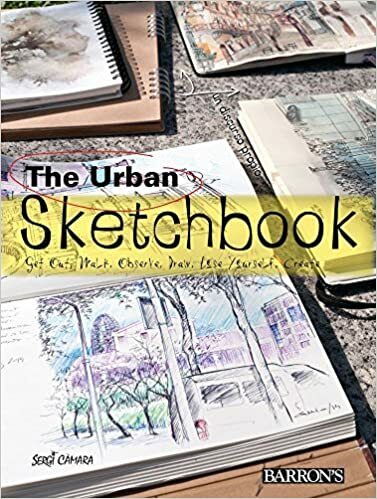 So, of course, when I saw this book– The Urban Sketchbook — on the shelves of our public library, I had to grab it, take it home and peruse what was inside. If I had any doubts, the tagline on the cover had me before page one: Get Out. Walk. Observe. Draw. Lose Yourself. Create. First of all, I didn’t even know that Urban Sketching was a thing. Of course, it’s a thing. Folks organize and gather together with sketchbooks in urban centers all over the globe and head out to the streets and city blocks to find scenes to sketch, some of which may be turned into more formal art. Most will not. Most of the art will remain in the books. There’s an informal warmth to sketching. This book, a collection of ideas and resources by writer/illustrator Sergi Camara, is a fine introduction, touching on tools of the trade, the reasons why people sketch, the impact of social media on sketchbooks and collaboration, and more. There’s even an interesting introduction to the history of sketching. I felt a bit like an outsider here, but the text and images and examples of sketching was very inviting, and I didn’t feel as intimidated by the art as I thought I might be. I don’t live in an urban area. That didn’t matter. Carmara’s book gave me ideas on how one might view the world from different angles, with an eye for colors and lines and shapes and contours.